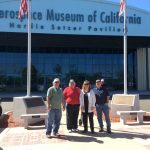 Several Chapter 1361 members conducted a fly-out to Sacramento’s McClellan Airport (KMCC) to visit the Aerospace Museum of California located just east of the runway. It was a Chapter effort to complete the first monthly EAA #AVChallenge. The Aviation Challenge is a new program by EAA in its ongoing effort to entice members to explore new aviation-related activities.